Custom moulded for the Samsung Galaxy A5 2017. 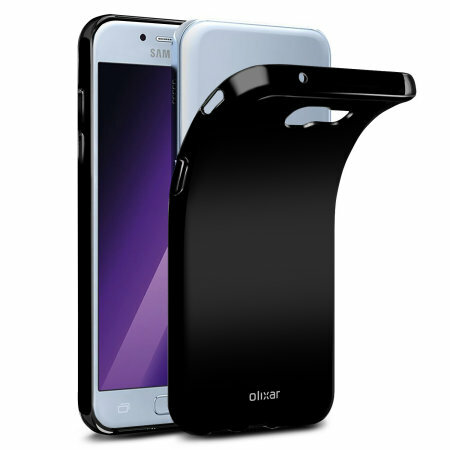 This solid black Olixar FlexiShield case provides a slim fitting stylish design and durable protection against damage, keeping your device looking great at all times. fits my phone perfectly, got a nice feel to it to, and the price was very good as was the service. Both smartphones I have had have been so slippery I needed one of these rear covers to stop then from slipping out of my hand. Works perfectly! The buttons on this new one are much better than on the one I got 3 years ago. Perfect product and very swift delivery! Website is so easy to find goods and this was perfect, just what I wanted and delivered in less than stated time. Phone cover even better quality than I thought which made it better value. Fits like glove. Have bought goods before and will again. Top marks!! Very nice, fits the phone well and is a lovely colour. It did not have a screen shield included. I shall now buy this separately as that would make me more confident taking the phone everywhere. This is an inexpensive product which has a very snug fit on the phone and makes it less liable to slip from ones grasp. Excellent fit and finish.Very pleased . 3) Provided just a little bit greater separation between my fingers and the face of the phone, so I don't accidentally activate an app. 4) Didn't interfere with a screen protector. This case does it all, and despite being non-slip, it has a very nice smooth texture making it easy to keep clean. This is a simply great phone protector. Protects the rear glass and the perimeter trim. Just the job but just a bit late to prevent cracking the front glass! This was exactly what I was hoping for. Nice material with a good feel to it, and a perfect fit. Excellent fits good , well made perfect !! Exactly as described fits perfect, good quality recommend it couldn't ask for more good value !!! Exactly what I was after at half the price of other brands although delivery took a little longer than expected. As described fits perfect prompt delivery Fantastic , recommend & wouldn't hesitate to use again many thanks !! Simple and cost effective cover that fits well and protects the phone well. Feels natural and nice to the touch when using the phone unless other more expensive covers. Does the job as expected. Thick plastic protects the phone casing. Great cover. Nice colour and simple to put on the phone. Gives phone good protection. Fits like a glove. Pretty color and gives a nice grip! Product was want I was after and much cheaper than what I could get locally. Happy customer and would recommend. Wanted to get screen protected from sticky fingers straight away. Instructions are not very clear. Peeled the first film off again by mistake. This case is exactly what a case needs to be, it protects the phone but is slim and sleek and does not get in the way. Very happy with the service and product quality. The quality of the product is very impressive and looks very premium in hand. Happy with purchase and prompt delivery..thank you! This is a great phone case to protect the Samsung A5. It fits neatly and is not heavy or two thick so it does not spoil the look and feel of the phone. I recommend this wholeheartedly. This case is exactly what I needed, it fits the phone perfectly and protects it without being bulky. The material feels comfortable and doesn't slip in the hand. When on a surface, such as a table, it stays put and will not slide off if pushed.